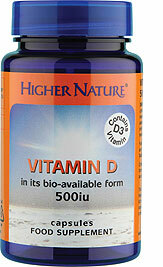 Higher Nature Vitamin D3 - Vitamin D3 (cholecalciferol) is the most bio-available form of Vitamin D.
Vitamin D is normally produced in the skin after exposure to sunlight, or we get it from fish and animal livers. This vitamin is vitally important for the absorption of Calcium, for strong healthy bones and for building strong muscles, but recent research has also shown it to be of great value in maintaining a healthy immune system. Vitamin D3 (cholecalciferol) is the most bio-available form of Vitamin D. If also taking a multivitamin, take one capsule a day. Take 1-2 capsules a day. Children over 8 years, 1 a day.